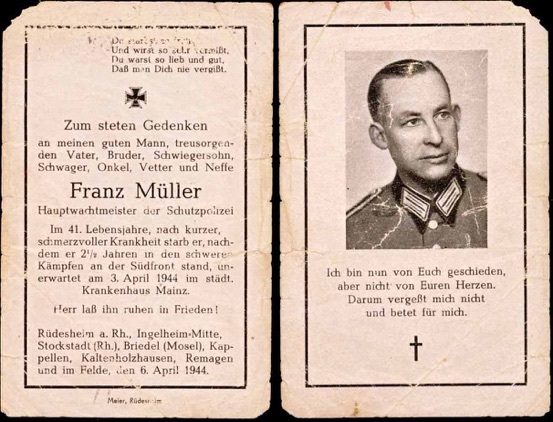 WW2 German Death Card (Sterbebild) for Protective Police Hauptwachtmeister Franz Mueller. After 2.5 years fighting on the Southern Front, he died after a short, painful illness in the hospital in Mainz, 3 April 1941. He was 41. Nice police NCO uniform photo. Single page double sided card measures about 2.5 x 4.5 inches. Very used condition with wear, as you can see in the scans. 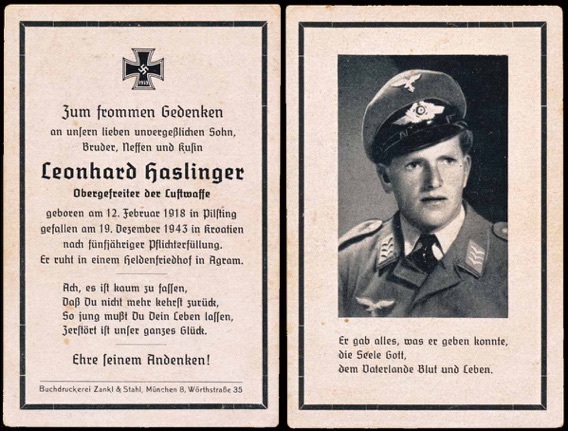 WW2 German Death Card (Sterbebild) for Luftwaffe Obergefreiter Leonhard Haslinger. He served 5 years. Killed 19 December 1943, Croatia, and buried in Agram. He was 25. Includes German Graves Office slip stating he was killed at the Zagreb-Gorica Airport and buried in Zagreb-Mirogol, Croatia. Double sided card measures about 4.5 x 2.5 inches. 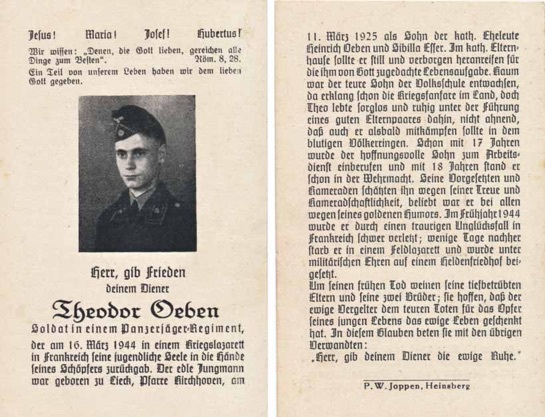 WW2 German Death Card (Sterbebild) for Army Soldat Theodor Oeben, Panzer Regiment. At the age of 17, he entered the Reichs Arbeits Dienst and at 18, the Wehrmacht. Early in 1944, he was the victim of an accident in France and died a few days later in the field hospital, 16 March 1944. He was 19, when he was buried in Champigny St. Andre, France. Nice photo in black Panzer wrap. Single page double sided card measures about 2.5 x 4 inches. Includes German Graves Office slip listing him as buried in Champigny St. Andre, France. 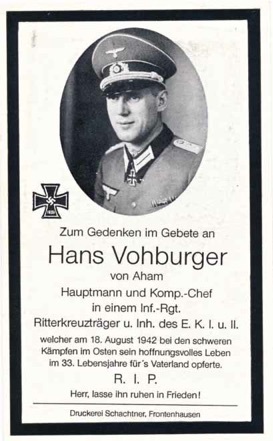 WW2 German Death Card (Sterbebild) for Army Hauptmann and Company Commander Hans Vohburger. From the town of Aham. He was awarded the Iron Cross Second Class, Iron Cross First Class and the Knight's Cross. He was awarded the Ritterkreuz as an Oberleutnant and commander of 7th company Infantry Regiment 19, December 14, 1941. Killed in heavy fighting in the East at the age of 33, 18 August 1942. Beautiful uniform photo wearing the Knight’s Cross. The back of the card has Jesus with a crown of thorns. The single page single sided card measures about 2.75 x 4.25 inches. Includes slip from German Graves Registration Office that he was killed in Upolosy south of Gshatsk and buried in Scharapowo by Wjasma, Russia. 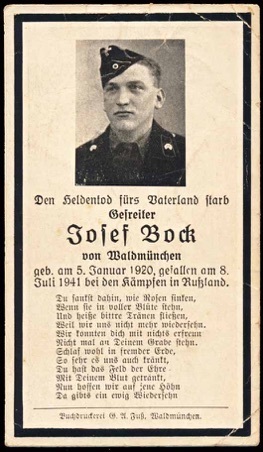 WW2 German Death Card (Sterbebild) for Army Gefreiter Josef Bock. From Waldmuenchen. Killed in combat in Russia, 8 July 1941. He was 21. The back of the card has Mary. The single page single sided card measures about 2.5 x 4.5 inches. Nice photo in black Panzer wrap tunic and overseas cap. Includes German Graves Office Slip that lists him as killed in Schrayrany and buried in Senno, Witebsk, Belarus. Bend to upper right and lower right tips. 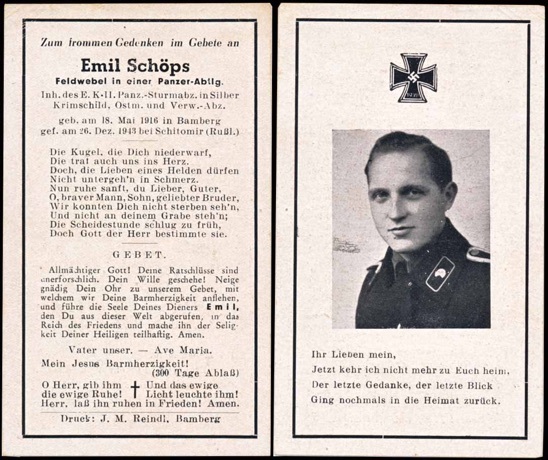 WW2 German Death Card (Sterbebild) for Army Feldwebel Emil Schöps, Panzer Unit. Was awarded the Wound Badge, Tank Asaault Badge in Silver, Russian Front Medal, Iron Cross 2nd Class and Krim Shield. Killed 26 December 1943 by Schitomir, Russia. He was 27. Nice photo wearing black Panzer wrap tunic. Includes German Graves Office slip listing him as killed 400 m. southwest of Zarewka and buried in Shitomir, Russia. Single page card measures about 2.6 x 4.5 inches. Good condition. 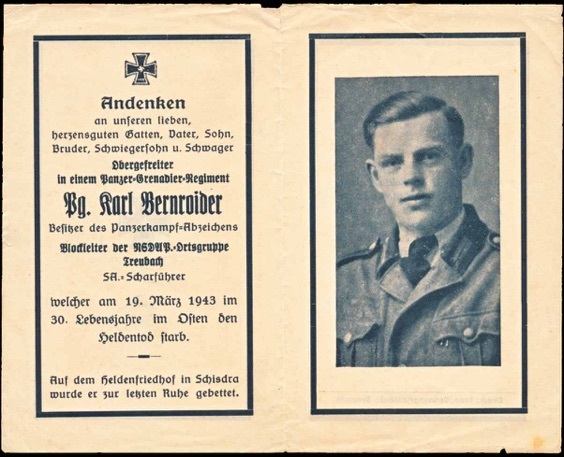 WW2 German Death Card (Sterbebild) for Army Obergefreiter Karl Bernroider, Panzer Grenadier Regiment. He was also an SA Scharführer and an NSDAP Block leader of Ortsgruppe Treubach. Was awarded the Panzerkampf Abzeichen. Killed in the East, 19 March 1943. He was 30. Double page single sided card measures about 6.25 x 5 inches. Includes German Graves Office slip listing him as killed in Josenok and buried in Shisdra, Russia. 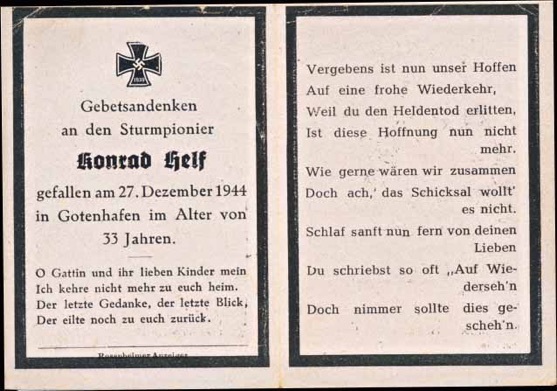 WW2 German Death Card (Sterbebild) for Army Sturmpionier Konrad Helf. Killed 27 December 1944, Gotenhafen. He was 33. Double page single sided card measures about 4.25 x 3 inches. Includes a slip from the German Graves Office listing him as killed during the evacuation journey from Gotenhafen to Swinemuende and lost at sea. On 27 December, the German armed yacht, HR1 Varouni was sunk off Gotenhafen. This was a part of Operation Hannibal, getting German troops of of East Prussia.